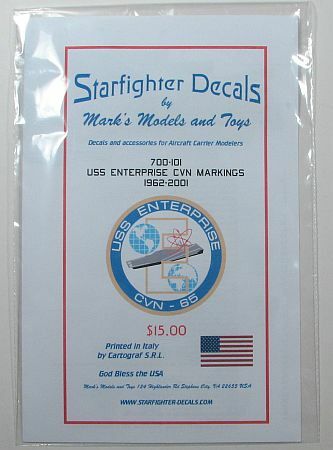 Starfighter Decals is definitely a multi-faceted company. You would think that with the name "Starfighter" they would release nothing but science fiction decals. Sure, they have those, but they also have so much more. Most of the time we review aircraft decals from Starfighter, but every once in a while they like to send us decals not aircraft-related. 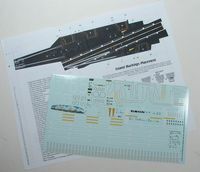 This time it's 1/700 markings for the USS Enterprise. Specifically, they're for the USS Enterprise, as she was sailed from 1962-2001. All markings are included and appear to be very complete. First there are markings for the main, upper surface. There are also complete markings, broken out by year-group, for the island. Finally, there are markings for the hanger deck, UNREP and elevator locks. As I mentioned earlier, this is a very complete set of markings. If you're looking for better decals for a 1/700 Big-E (and there is no kit preference mentioned) you'll definitely want to track down this set. Our thanks to Starfighter Decals for sending this set of review decals.